The Toronto Marlies got back to winning ways with a resilient performance against a fast and physical Springfield Thunderbirds team on Saturday. With a 4-2 victory, the Marlies extended their point streak to five games (4-0-1) and are now 12-10-3 on home ice after owning a losing record at Coca-Cola Coliseum for the majority of the season to date. Toronto almost got off to the perfect start, but Sam Gagner’s blast from distance struck the iron, hit the back of goaltender Samuel Montembeault, and didn’t have enough pace to cross the goal line. Just 19 seconds later, Springfield took the early lead with a highly-debatable goal. Michael Hutchinson appeared to have hold of a shot by Jamie McGinn, but the puck squirted loose and a scramble ensued in front of the Marlies net. While Jonathan Ang prodded the puck across the goal line, there was a definite whistle blown beforehand that was disregarded by the officials, much to the Marlies‘ consternation. It took the Marlies until the midway mark of the period to respond — they had Springfield hemmed inside their own zone for the better part of two minutes, but they were unable to find a way past Montembeault. 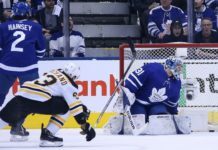 The breakthrough arrived inside the final three minutes, when Toronto struck seven seconds after their first power play expired. A fancy passing movement involving Dmytro Timashov and Adams Brooks was deftly finished by Gabriel Gagne for his fifth of the season and first as a Marlie. Toronto was fortunate to head into the intermission down by just a goal, however, as Calle Rosen’s risky pass across his own blue line was cut out by Bobby Farnham and Hutchinson came up with a huge save with 10 seconds remaining in the opening frame. Offsetting penalties to end the opening stanza meant the second period began with four-on-four action, where Martin Marincin took advantage of the extra space by almost scoring a highlight reel goal after a give-and-go play with Jeremy Bracco. That near miss resulted in a second power-play opportunity for the Marlies during which Chris Mueller was robbed by Montembeault. Almost out of nothing, Springfield retook the lead four minutes into the middle frame as McGinn’s speculative shot took a deflection off the body of Thomas Schemitsch driving the net. The ice was tilted for the following three minutes as the Thunderbirds swarmed the Marlies and could easily have extended their advantage. The Marlies’ fourth line turned the tide for the Marlies with Timashov drawing a penalty. On the resulting power play, it was the inevitable combination of Bracco and Mueller combining to tie the game at two apiece. Mueller finished a tap-in from Bracco’s pinpoint slap pass after Gagner struck the post seconds earlier. There was almost an immediate response by Springfield, but Hutchinson denied Sebastien Repo from the slot. The physicality was now ramping up as the Marlies went to yet another power play. It wasn’t for a lack of trying that Toronto couldn’t convert with the extra man — the unlucky Gagner was denied by some good saves and blocks by defenders on the line, while Calle Rosen also fully tested Montembeault. The almost inevitable fight arrived with five minutes remaining in the middle frame as Vincent LoVerde took umbrage with Paul Thompson after the forward delivered a questionable hit on the returning Rasmus Sandin. The Marlies defenseman came out slightly worse for wear in both the physical contest and penalty count as he was handed a two, five and ten for his actions. Toronto responded by shutting down the league’s top-ranked power play unit and scored a shorthanded goal to add salt to the wound. With three Springfield players caught below the goal line, Adam Brooks won a battle on the left half wall, creating a 2-on-1 break for the Marlies. Moore sped away down the left side and showed NHL quality by out-waiting the trailing defenseman before presenting Brooks with his first ever professional shorthanded tally. Following a second period that featured a combined 29 shots, three goals and 28 penalty minutes, the Marlies got back to their structure in the final frame and never allowed Springfield to build up a head of steam or create any sustained offensive zone pressure. Brooks really should have doubled the Marlies lead 15 seconds into the period, but he fired high from between the hashmarks with time to pick his spot. The Thunderbirds first real scoring opportunity of the period resulted in Matt Marcinew striking the post before Hutchinson was forced into a sharp right pad save on the same play. The aforementioned Marcinew had a second excellent chance after exiting the penalty box to create a 2-on-1 rush with nine minutes left in regulation. Set up by Ang, Marcinew was stonewalled by Hutchinson, who showed excellent concentration after a spell of inaction in front of him. Toronto’s goaltender was only forced into one more save of note through the remaining time, turning aside Juho Lammikko with his left pad. The victory was then secured by Pierre Engvall’s empty-net marker, ensuring the Marlies remain third in the North Division with Utica Comets hot on their tail. – Special teams and discipline were two of the keys to the game against a Springfield team that looks to antagonize at every opportunity. The Marlies were 1-5 on the power play, scored one shorthanded goal, and gave just one extra man advantage to the team leading the power play rankings. – Michael Hutchinson was a regular recipient of Springfield’s brand of physical and intimidating hockey — ran into, hacked, and slashed on multiple occasions. He kept his cool and turned aside 28 shots for the victory in what was a good bounce back for him following a poor performance against Belleville. – With two assists, Jeremy Bracco returned to the top of the AHL rankings in that category, tied with Daniel Carr with 34 on the year. It also means he’s back at a point-per-game pace through 47 games. – Chris Mueller scored for a fourth straight game, has recorded two points in each of his last three outings, and is riding a five-game point streak (4-4-8). – Adam Brooks hit the 20-point mark in his 35th game with a goal and assist and now has 10 points in his last 10 games. With his sixth multi-point haul this season, he’s now surpassed his rookie year total of 19 points (8-11-19) accrued in 57 games. – Dmytro Timashov also hit a point milestone with a lone assist. It was the winger’s 30th point in 45 games as he is continuing to flourish on a line with Colin Greening and Michael Carcone. – Calle Rosen extended his point and assist streak to five games (0-7-7) with a secondary helper on the power play goal. – Rasmus Sandin made his return to action since sustaining an injury at the World Juniors. Considering how physical the game was, the rookie handled himself well and formed a solid enough partnership with Jordan Subban.